Social Media has become an essential part of everyday life and one of the most cost-effective ways to drive brand loyalty, sales and brand awareness. You’ve begun your online presence by setting up some social media profiles… Now what? Our team of Social Media experts will assess your business needs and advise you on which social platforms are the most appropriate for you to reach your audience, strengthen your brand positioning, manage and monitor conversations and ultimately increases sales. Being one of the top social media agencies in Dubai, Verbat will help your company scale new heights. Founded in 1999, Verbat has worked with government agencies, multinational organizations, SMEs and has represented their growing digital brands on social media in the UAE. Our multi-focused and effective social media marketing strategies help you build strong engaged communities and open up new sales channels for your brand. We will develop custom social media strategies for your business and choose which platforms will suit this strategy best. A well created plan, executed regularly will help you interact better with your audience and analyze social media trends specific to your business. 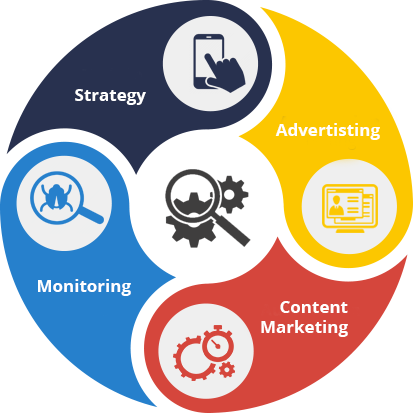 We build a community of users who will belong to your business category and monitor them on regular basis. Furthermore, we will link to niche relevant pages and communities to expand your business identity in the relevant circle. We distribute and share your content on social media sites to help achieve targeted users from diverse sources. Advertising on Facebook, LinkedIn and Twitter needs creative and convincing tactics, which our team owns abundantly. We excel in bringing in maximum value to your business at minimum possible cost. We start a promotion campaign for your products by sharing your business information and products details in such a way that users will get attracted and eventually you will get big turnovers. With about 1.87 billion monthly active users, Facebook is the most popular platform for both individuals & businesses. With about 313 million monthly active users, Twitter is a sea of information waiting to be read, clicked, followed and retweeted. Ideal content sharing platform. Its Circles feature offers businesses segmenting options to appropriately target groups of followers. YouTube is the leading video sharing platform in the world. It gets over 30 million visitors per day. Instagram has over 600 million monthly active users and Pinterest has over 150 million. Posts are in picture format with short captions. We use social networks to establish your brand as well as increase its awareness among potential customers. We provide instantaneous customer service, by offering clear channels of communication for customers to register complaints, concerns, and suggestions. With our social media marketing, your engagement with customers is much more valuable because they chose to interact with your brand and are more likely to convert.